Have you noticed how much I love to layer? It’s one of my favorite tricks for being able to wear staples like this shirt again and again with a bunch of different things! I know I also mentioned recently how much I love the look of a blouse layered under dress. It’s a polished way to take your favorite sleeveless shifts and dresses all the way through winter. 1.This modern black midi dress is softened by pretty pleats. A gorgeous piece for the office! 2. Take the off-the-shoulder trend from spring/summer through winter with this cozy sweater in black. 3. A good white jacket is hard to find, but this textured style with a little extra fringe is a surefire winner. 4. I love a good military-style coat, but they can often look a little harsh or too themed. This option is more subdued and has a flattering fit-and-flare waist! 5. If you love leather but are shopping on a budget this fall, check out this high-neck leather dress. The silhouette and shade are both stunning and it looks like the real thing! Love this outfit! I noticed the arms of the jacket look short on the zara website. However, it could be that the fit model has super long arms. Are the arms short on you? You ALWAYS get it right!!!! This is a beautiful layered look, and I want your closet!!!! Beautiful post!!! love it! So classy and fun at the same time, and grey is always a good idea. Merritt this look is SO GOOD! 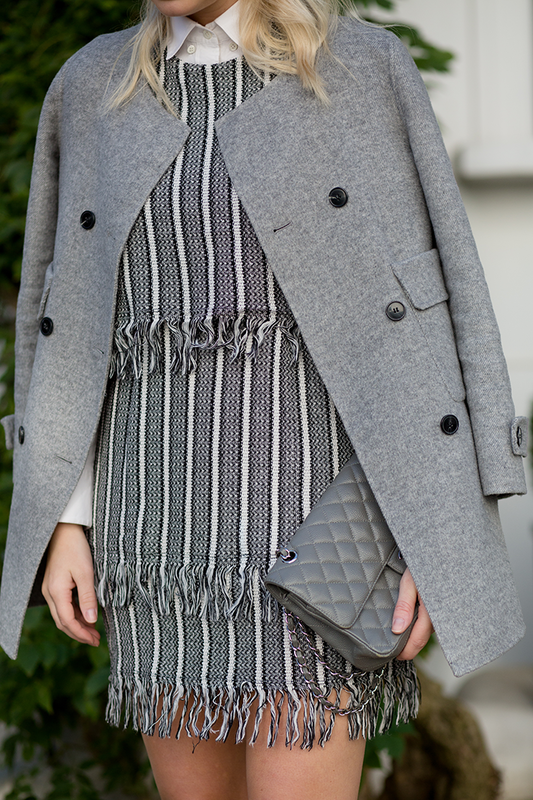 The fringe and gray layers are amazinggggg! Love this dress on you! That fringe is so chic and perfect layered over a white button up! This outfit is absolutely stunning. Love the color combination here as well as the way that you have styled this dress! I have fallen in love with this whole outfit! This is amazing!! You seriously have the best style. Your posts just keep getting better. I might need this dress!